I found it impossible to select a single Huston film to highlight above. 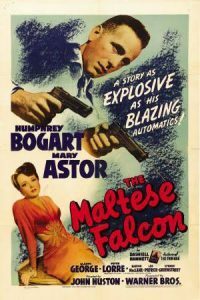 When the first movie that you direct is The Maltese Falcon (Humphrey Bogart version which made all others superfluous) followed a few years later by The Treasure of the Sierra Madre, well… let’s just say that favorites become impossible to pick. For that matter, In This Our Life which came between the two is no slouch either though not considered a classic. If I had to guess, I would say that he was associated with more of the best films of the 20th century than any individual who did not run his own studio. Pick any one of them and have a great time. If you are of a certain age, then you may know John Huston as part of a famous Hollywood family. If you follow Hollywood, then you know him for Prizzi’s Honor (his last hit in 1985). Maybe you recall him dying somewhat publicly while trying to finish his last eerily apropos film, The Dead. If you are a bit more obsessive about movies, then you may know that he was responsible for Annie, Key Largo and The African Queen. Writing about the experience late in life, Kathryn Hepburn made much of the trials of filming in Africa with Huston and Bogart, so that filtered into the publicity ether also. If you are not of a certain age, then the name is likely new to you. Even his offspring have faded from significant public notice. remains among the finest in the first century of film-making. Nevertheless, I wonder how many people actually see it. This is an old problem, as bad as a modern baseball player asking who Stan Musial was. I don’t think the comparison is inappropriate. Film and baseball came to true prominence in the early 20th century as major American industries. Both Musial and Huston are names which anyone doing the least delving into their respective histories will get to know. Alfred Hitchcock is more like Babe Ruth, but neither of them is anything like the whole story. Art and sports are ephemeral, the quality which leavens them with significance as they boil our lives down to moments. In truth, the very nature of artistic and athletic moments almost demands that they pass unremarked and unremembered. If you were not there, then what does it matter? While art and sport occur in a vacuum created by all the participants, that moment as communication between creator and spectator exists only for them. Its significance is theirs as shared emotion. But that leaves out the value of the moment to a shared culture. We create our culture as a society by selecting those artistic (and athletic) moments that we will value and carry forward. The question becomes how you want to define your society. Going forward, will it be inclusive enough to include John Huston and Stan Musial, Yasujirō Ozu and Bart Starr, Raoul Walsh and Kapil Dev? The blessing of culture is that, while it adds distance to the original event, we move forward with technology that allows us to recreate some of the magic of those achievements. You’ve Got to Check This Out is a blog series about music, words, and all sorts of artistic matters. It started with an explanation. 228 more to go.